What’s the use of summer without gingers? I hear that some folks have to do without them. They don’t have much to do with gingers in Connecticut, I’m told. I guess there’s not enough summer there to even bother. But when summer is as long and tropical as it is here on the Gulf Coast, the garden begs for gingers. Not just the gingers that you eat — though there are many edible gingers, from the common grocery store ginger to turmeric to exotic treats like galangal ginger — that are worth growing in the South. But we’re here today to talk about the gingers that we along the Gulf Coast know as ginger lilies. And a ginger lily is simply a ginger that is pretty enough to be an ornamental. There are hundreds of species of gingers, and by now there must be thousands of cultivars, each with a flower of a different color or fragrance or shape, some only inches high, some 10 feet tall. 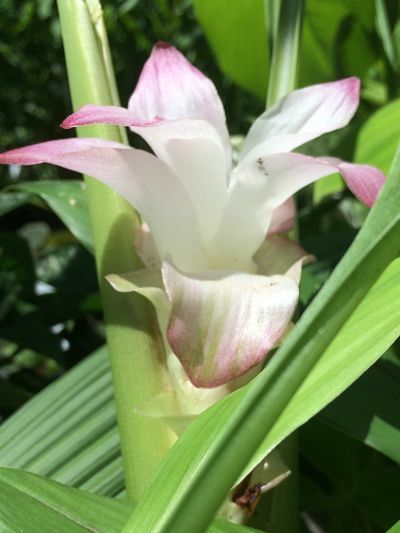 The most famous ginger lily of the South is the one commonly called “butterfly lily” or sometimes, “butterfly ginger.” This is the famously fragrant, white flowering ginger that grows, oh, about shoulder height, and will spread from one end of your yard to the other, if you give it too much time alone. 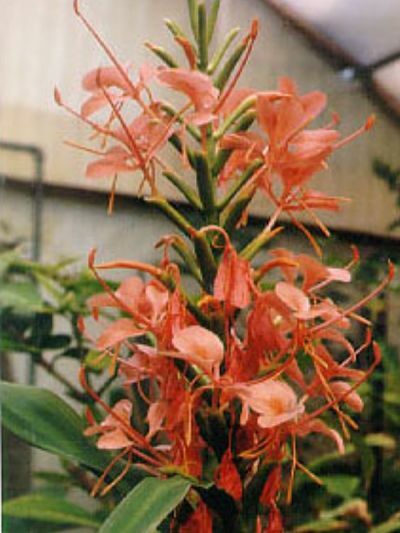 — These gingers resemble the butterfly ginger, and are closely related, but the flowers are often very colorful, in shades of orange, red, pink, or mauve. Spectacular, tough, fragrant, colorful, and all are about head high when mature. All of these are quite hardy in all of South Alabama. Includes the varieties Elizabeth, Dr. Moy, Ayo, coccineum, red butterfly and yellowheart. 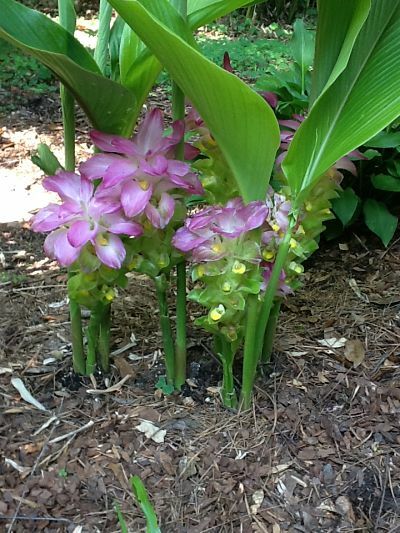 — This group of gingers is an old-fashioned favorite, and it includes the curcuma gingers, which have unusual flower stalks that look like jeweled pagodas, in various shades of pink, lavender, red and yellow. 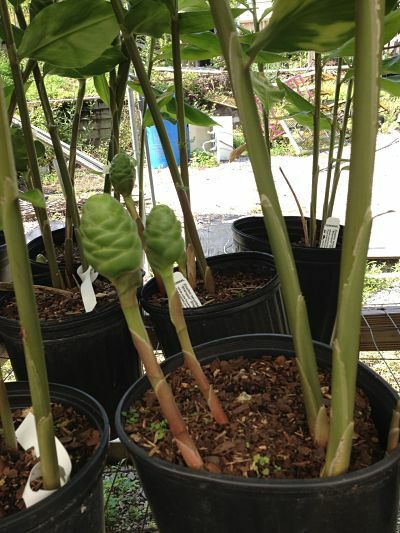 These are big-leafed gingers, but they have short or non-existent stalks, and the tips of the leaves and flowers are rarely more than 4 feet high. Almost all hidden gingers are hardy in South Alabama, but a few of the most recently introduced varieties may not return after a cold winter. Includes the varieties ‘Khymer Orange’, ‘Purple Prince’ and Curcuma elata. — The cool thing about the spiral gingers is that they do just that — the plants grow on stems that resemble a leafy corkscrew. But the flowers are often quite distinctive and showy, as well. Many are hardy along the Gulf Coast, but some may be lost in cold wet winters. 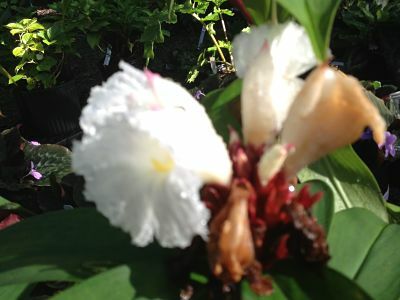 Includes Costus pictus, Costus speciosus “Crepe ginger,” Costus maletorianus, the velvet stepladder ginger and Costus arabicus. 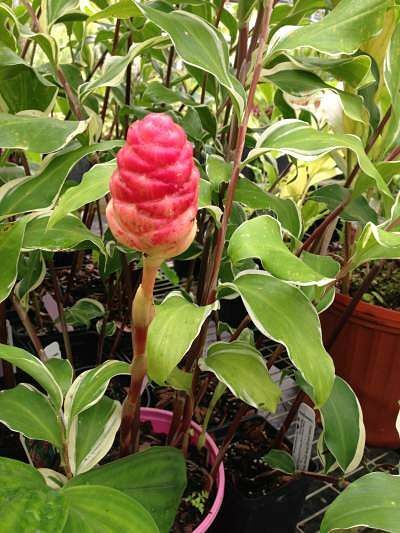 — Imagine a large unopened pinecone that has just been dipped in glossy red, yellow or white wax, and you’ll have a good notion of what the flower of this ginger looks like. It has been around Gulf Coast gardens for the better part of a century. Most of these are hardy along the Gulf Coast. 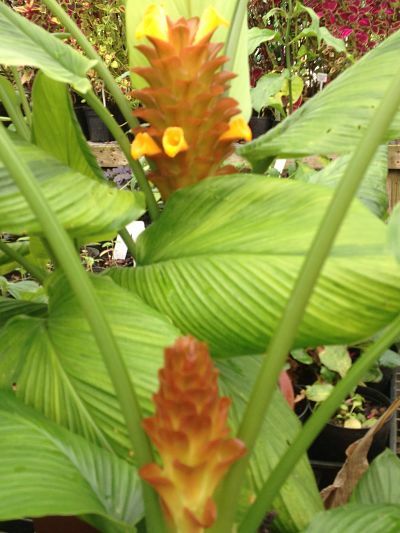 — Think of these gingers as tropical hostas. Some are not 12 inches high, most don’t grow much taller than your knees. 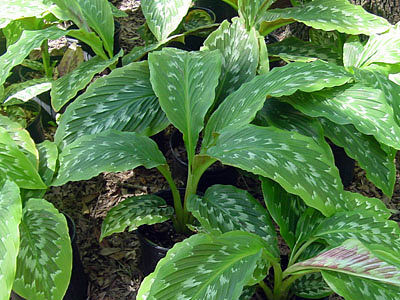 But the leaves are often bodaciously large and incredibly showy, with colorful patterns and markings that make hostas look dull in comparison. Many have spectacular flowers as well. We’ll list several of these in our catalog in coming weeks, so stay tuned. — In theory, all gingers are edible, and some may like to experiment. But some gingers are so sharp and pungent as to be unpleasant. The most refined ginger flavors come from the classic grocery store ginger (Zingiber officinale), the galangal gingers (Alpinia galanga or Kaempferia galangal), and the famous curry spice, turmeric (Curcuma longa). Butterfly gingers can grow almost anywhere, under almost any condition. But the blooms last longer and look their best with some protection from midday sun; conversely, plants in too much shade may produce abundant foliage and few flowers. Dwarf peacock gingers require highly organic soil that is moist but well drained, and they will need some shade at midday and in the afternoon. The other gingers fall in between those two in their preferences. But provide some midday shade, an abundance of organic matter, water during drought and well drained soil in winter, and they’ll all do well. This article by Bill Finch was first published in july 2012. Reprinted with permission. Some outdated references to the ReBloom catalog were omitted or deleted. New Website - Same URL!